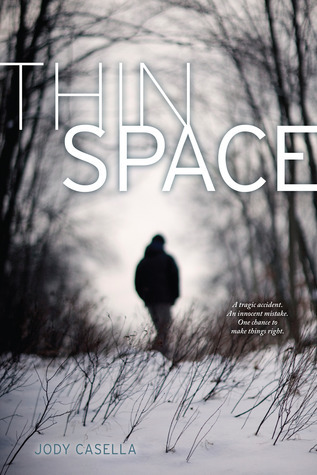 Thin Spaces (Goodreads | Amazon) was an acceptable book but didn't really shine. Ever since his identical twin brother died in a car crash Marshall has been overwhelmed by guilt. As the driver and the one who planned the ill-fated double-date, he blames himself. When the little old lady next door tells him about thin spaces, portals between life and death, and promises to create one when she dies by dying where she first game into the world Marshall becomes obsessed with the idea of finding his way to the other side. Walking around barefoot in hopes of stumbling into a thin space, Marshall is consumed by his grief. While I tend to be drawn to stories about grief (I don't know why. Maybe it's the visceral emotions with it all), this just doesn't stand out. When I look back at my notes I didn't underline any passages, didn't write down much of anything. There were some things that were hard to believe, a very personal conversation that the main character and his love interest (because of course there's one) have in a movie theater during a movie. The fact that there was an unnecessary love story (seriously couldn't she have just been a friend?) and it takes the stereotypical new girl to help wake Marshall up. What's worse is that for me the book was very predictable. I figured out pretty much everything ages before the main characters or anyone else in the book. I've read much worse books dealing with grief but I've also read much better books. I received an advance reading copy via Netgalley in exchange for an honest review.